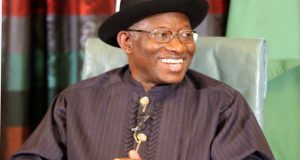 Former President Goodluck Jonathan ignored a court order to appear at the Federal High Court, Abuja, today, to give evidence in support of former publicity secretary of the Peoples Democratic Party, Olisa Metuh. The former president was no where in sight when the case was called today. Justice Okon Abang has, however, ordered the bailiff to serve the former president within five days the subpoena compelling him to appear in court. The Court of Appeal, Abuja, on Oct.3 granted an application filed by Olisa Metuh, to compel the ex-president to testify in the N400 million fraud charge brought against the applicant. On Tuesday, Justice Okon Abang held that the ex-president was mandated by the decision of the appellate court to appear before him to testify in the criminal suit. The judge also said that retired Col. Sambo Dasuki, former National Security Adviser (NSA), was billed to appear in the matter on the same date as a defendant witness. Abang in his ruling on Wednesday noted that without the two summoned witnesses appearing, the court might not be able to make any progress in the case. The N400million was alleged to have been disbursed from the Office of the National Security Adviser.